Remember you can’t care for your loved one if you are ill yourself. The first step in dealing with caregiver stress is to recognize the signs. Then, you can find ways to deal with it and enlist support or medical help when needed. Depression. Symptoms include constant sadness, feelings of hopelessness and increased crying. Withdrawal. This can occur if you are depressed. You may not wish to see family and friends. You may stop taking part in things you used to enjoy. Anxiety. You may feel anxious to get things done or you may feel that you don’t have enough time, or about facing another day and what the future holds. Anger. You may start yelling at your loved one more, or have difficulty controlling your temper with other people. Caregivers often become angry at their loved one because they are sacrificing their own lives to care for them. Feeling angry at family members for not helping is also common. Loss of concentration. You are constantly thinking about your loved one and everything that you need to do. As a result, you have difficulty concentrating at home or at work. Changes in eating habits. This results in weight gain or loss, as well as increased illness. Insomnia. You may feel tired, but cannot sleep. Or, you may not feel tired even if your body is tired. You also may wake up in the middle of the night or have nightmares and stressful dreams. Exhaustion. If you frequently wake up feeling you can’t get out of bed despite a good night’s sleep, you’re in distress. Drinking or smoking. You may find that you are drinking or smoking more. Or, you start drinking or smoking when you haven’t in the past. Health problems. You may catch colds or the flu more often than usual. This is particularly common in caregivers who do not take care of themselves, by not eating properly and exercising. Use respite and healthcare resources available to you. Taking a break, and ensuring your loved one is well cared for is one of the best ways to reduce stress. If you need financial help, don’t be afraid to ask family members to contribute their fair share. Say “no” to requests that are draining and stressful, such as hosting holiday meals. Forgive yourself for your imperfections. There is no such thing as a “perfect” caregiver. Identify what you can and cannot change. You may not be able to change someone else’s behavior, but you can change the way that you react to it. Keep in touch with family and friends and make time for yourself. Join a support group for caregivers. If your loved one has a particular affliction, such as Alzheimer’s or dementia, look for a support group targeted at that disease. Make time to be physically active on most days, even if it’s a short walk. Eat a healthy well-balanced diet and get enough sleep. Keep your sense of humor and practice positive thinking. Find out about caregiving resources in your community. Your Area Agency on Aging (find it in the phone book) is a great, free resource. If you work outside the home, consider taking a break from your job. 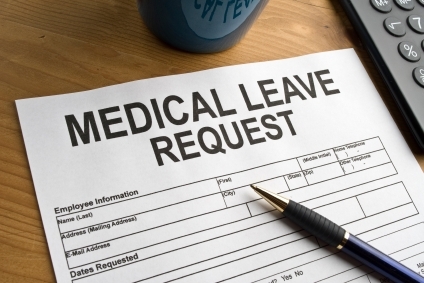 Employees covered under the federal Family and Medical Leave Act may be able to take up to 12 weeks of unpaid leave per year to care for relatives.